Summer Wild Adventure Programs - Earth Ltd.
Make your child’s summer break a Wild Adventure! We offer program sessions for the following grade levels: K – 2, 2-3, 4-6, and 7-9. Our young adventurers will explore the zoo and learn through a variety of hands on activities such as games, crafts, and even meeting some of our animals up close and personal. All Wild Adventure students also get to tie-dye their own t-shirt. Programs range from a half day program for younger children to a program for older children interested in careers relating to zoology. 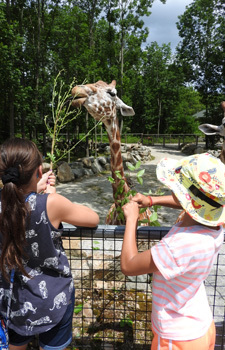 EARTH members receive a 10% discount on Summer Wild Adventure Programs. To receive your member discount when you register, click “enter promotional code”. Your code is the first 5 letters of your last name + the first 2 letters of your first name. Example: John Smith’s code would be SMITHJO. If your last name is fewer than 5 letters, just use your full last name + the first 2 letters of your first name, Jane Doe’s code would be DOEJA. 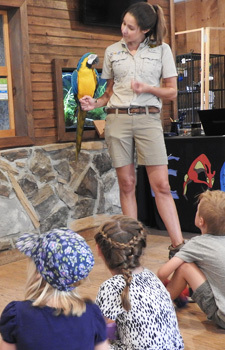 Learning about the zoo’s 150+ different species, exploring local wetlands and catching frogs, creating enrichment for the zoo’s primates, live birds of prey presentation, giraffe encounter, rhino encounter, games, crafts, and more! Learning about the zoo’s 150+ different species, touching and holding small reptiles, train ride through North American exhibit and wetlands, meet animal ambassadors in the EARTH Discovery Center, tie-dying a t-shirt to bring home, arts and crafts, and more! Learning about the zoo’s 150+ different species, exploring local wetlands and catching frogs, live birds of prey presentation, creating enrichment for the zoo’s primates, touching and holding small reptiles, tie-dying a t-shirt to bring home, games, crafts, and more!